Since the beginning, we have been preparing our sausage from pork raised in local farms committed to the well-being of animals. By using pork coming from known sources, we can guarantee the quality of the meat we are using, allowing us to offer superior grade deli meat. It’s essential for us to know where our meat is coming from, since it allows us to know the conditions in which the pigs were raised and slaughtered. Our pork farmers are all certified by the Animal Care Assessment program and have animal wellness at heart. The Animal Care conditions are assessed based on the physical, psychological and physiological abilities of the animal to adapt to its environment. 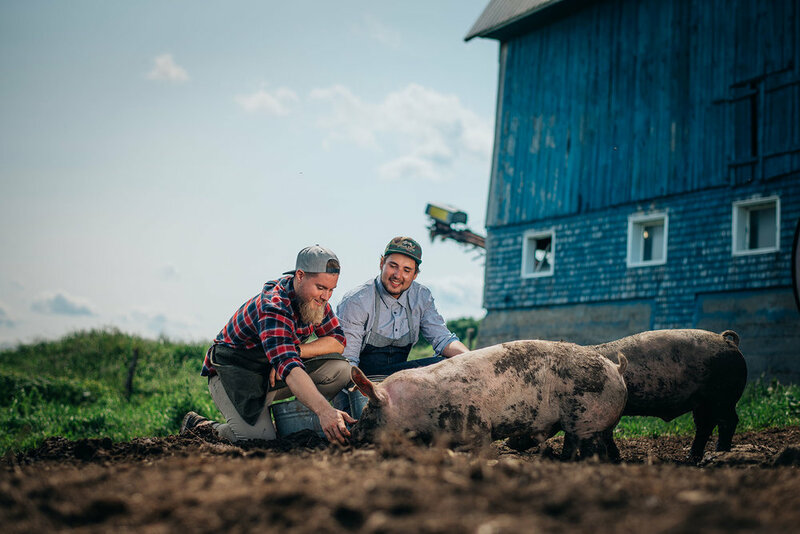 By practicing responsible farming, Quebec’s pork farmers are guaranteeing appropriate care and a quality environment from birth to the slaughter house. We’ve got excellent new for you: given the increasing demand from the customers to know the conditions in which the animals were raised, all Quebec’s pork farmers must be certified by the PigCARE program since January 1st, 2018. So you can be assured that by choosing Quebec’s pork, fresh or processed, (in delicious sausages for example) your pork has been raised with the best cares one can offer. By verifying the origin of the pork you eat, be it by checking the packaging or browsing company websites, you can make sure that you buy pork that was raised in a responsible way, as well as encourage local economy. However, you have to be careful: despite the fact that Quebec is a major producer, 70% of Quebec’s pork is exported, which means that several products, either fresh or processed, are not made from Quebec’s pork. One thing is certain however: all the delicious Pork Shop sausages you love are made from Quebec-raised pork. Is it safe to eat cured meats during pregnancy?